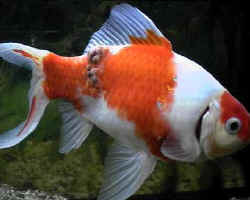 - Re: Fin rot or Septicemia? - Hi Jason, <Hello to you!> Well you shamed me into spending my hard earned pennies! I have just spent the princely sum of 52 pounds on a Fluval underwater filter, treatments from the aquarium doctor, Tapsafe and ammonia remover. Is it safe to put all these treatments in at the same time? <I would avoid it... work on one thing at a time - get that filter running... if you got some furan compound or similar for the fin rot, I would start with that... using the directions.> I also purchased some oxygenated plants recommended at the aquarium centre - you'll make a goldfish lover out of me yet! Mouth Rot Ok I took a water sample to the pet store to have them test it. 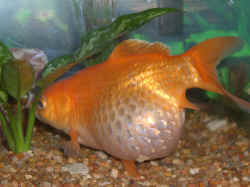 <ok>They said that the ph is a bit lower than what gold fish like and everything else is ok.<pH could be the problem here> Could this be what is causing the problem?<could be> The fish is still in isolation and I have given him a dose more than is recommended.<don't overdose on medication, most medication is toxic to a certain extent. would you overdose on prescription drugs?> The pet store said to keep him isolated for another week and then put him back into the main tank,<I would wait until he is fully healed and very healthy> and then see what happens. Any more advice?<Keep good water quality and you should be ok, IanB> Thanks, Ana.